A company producing Ti 6 Al-4V ELI medical implant components using additive manufacturing came to Lucideon for evaluation of discolored surfaces on their finished parts. The discoloration became visible after post-AM hot isostatic pressing (HIP). 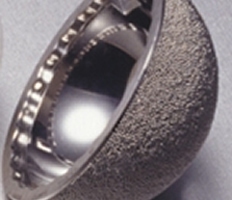 HIP is used to sinter residual powder particles left on surfaces during AM and to close internal porosity in AM components. Surface contamination due to improper HIP processing. Make recommendations regarding correct HIP processing. Based on the analysis performed the contamination source could be identified and eliminated from processing. This allowed our client to avoid expensive scrap costs on finished parts in the future. The client was also introduced to materials analysis expertise available at Lucideon. Post processing of AM components can affect surface chemistry and material microstructure. Materials analysis, including advanced surface analysis techniques, scanning electron microscopy (SEM) and microstructural analysis, provides critical information for troubleshooting manufacturing problems.